The drink that’ll change your life? 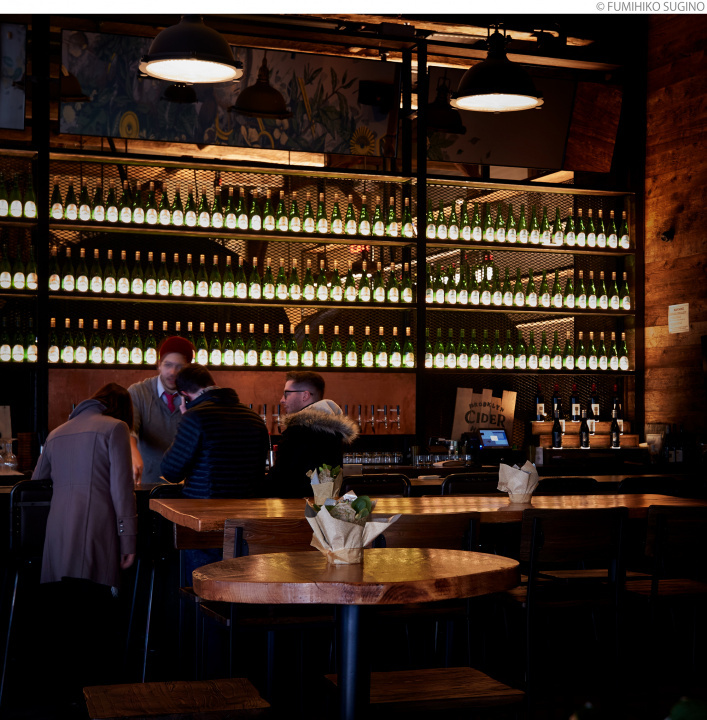 Infatuated with Brooklyn Cider House. 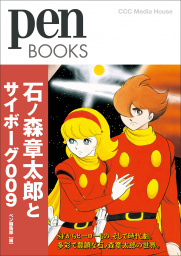 昨年末にオープンした「ブルックリン・サイダー・ハウス」のオーナーのピーターさんと妹のスーザンさん。学校の先生だったスーザンさんは、いまお兄さん以上にサイダーに夢中だそうです。Owners Peter Yi and his sister Susan of Brooklyn Cider House, which opened at the end of last year. Susan used to be a school teacher, but she’s now more taken with cider than her brother. Three o’clock on a weekend afternoon in July. 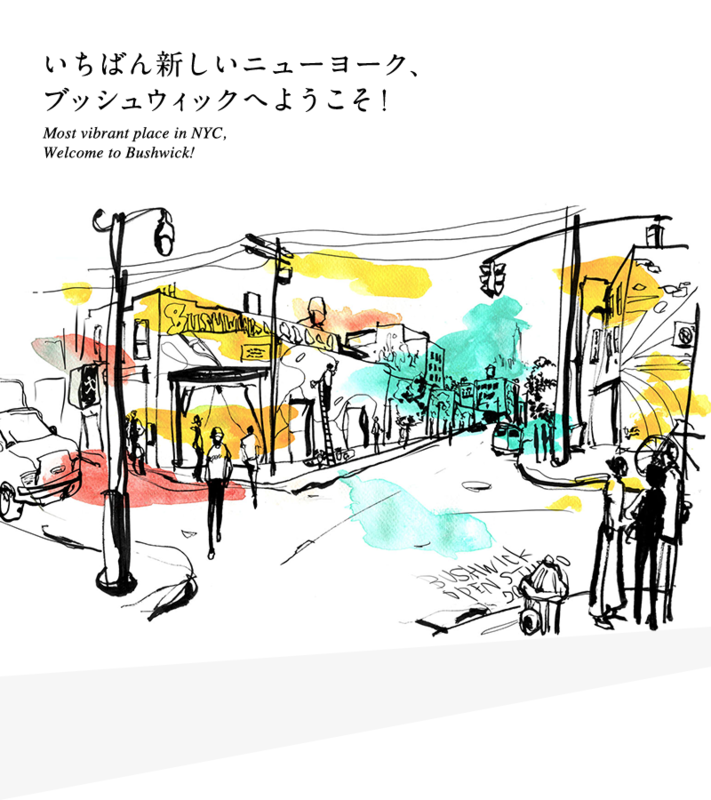 I was going to meet a friend from Japan at Brooklyn Cider House on Flushing Avenue, one of Bushwick’s main streets. Although New York’s summers are short, the sun’s rays are strong and the humidity is high. On a day like that you want something that fizzles, and my friend liked alcohol of any kind. So, instead of a regular beer, I decided that she should try freshly made apple cider. 食肉加工工場だった建物を大改装！店に入ると、モダンで落ち着いた雰囲気のバーエリアが広がります。A full renovation of a building that used to be a meat processing factory. 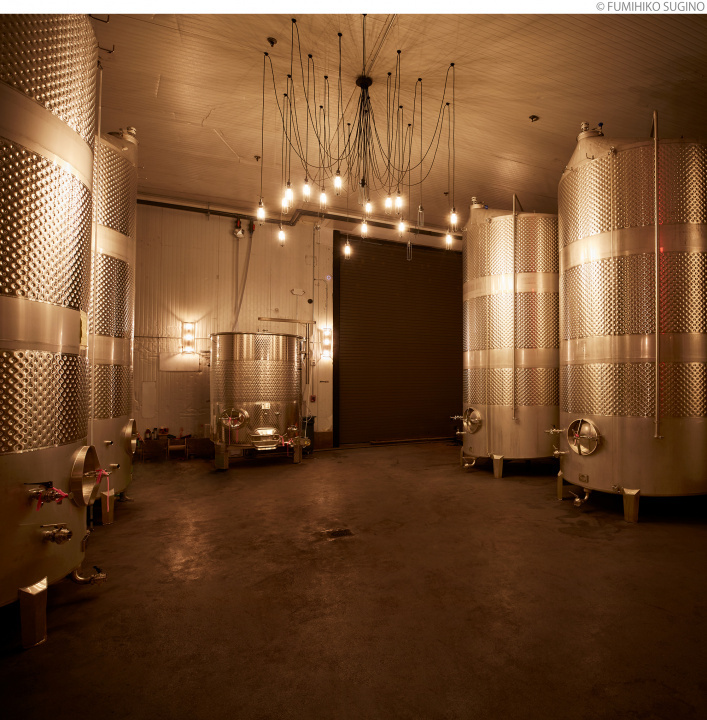 Entering the establishment, you find before you a modern but warm bar area. 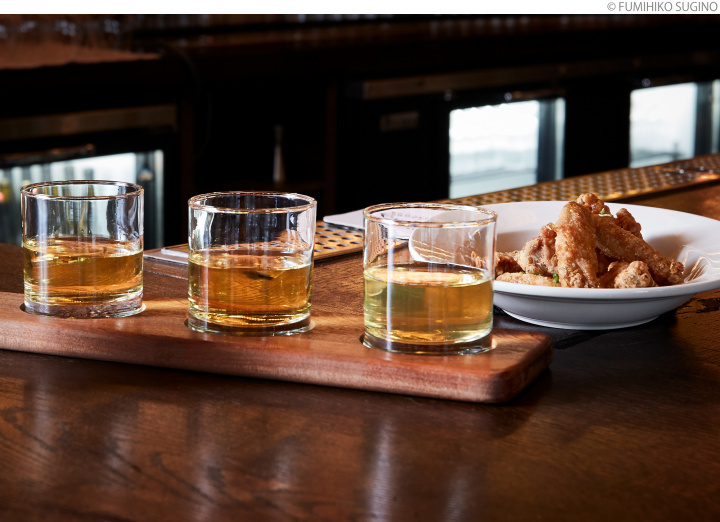 バーでのおすすめは３種のサイダーの飲み比べセット＄9。写真奥のコリアン・チキン・ウイング＄9やタコス、ハンバーガー、パジョンなど気軽なおつまみも楽しめます。The bar’s recommendation is a tasting flight of three ciders for 9 dollars. You can also enjoy casual snacks like the Korean Chicken Wings ($9) shown in the back, as well as tacos, burgers, and pajeon. Actually, it’s not exactly correct to call this “apple cider.” In the United States, this sparkling alcoholic beverage made from apples is called “hard cider.” Its alcoholic content is half that of wine, and since it isn’t as filling as beer, it goes well with meat, fish, cheese, eggs, and practically everything else. バスクから取り寄せた古い樽の前で「サイダー・キャッチング」のお手本を見せくれるピーターさん。生サイダーの香りを高めるために行われるバスク伝統の樽出し法です。Standing in front of an old barrel imported from Basque, Peter demonstrates “cider catching,” This is a Basque tradition to enhance the aroma of fresh cider. 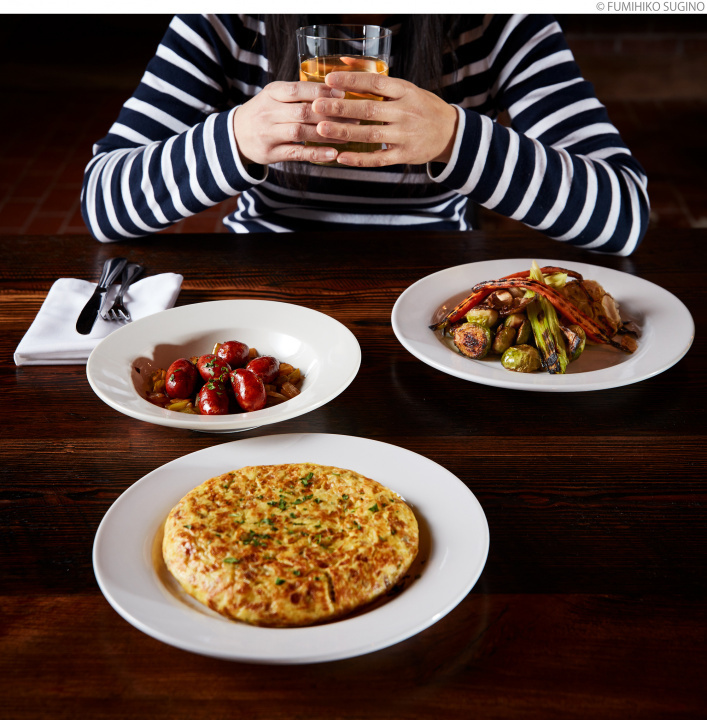 The four-course meal with cider catching includes chorizo sausages and Spanish omelette, a traditional menu in cider houses in Basque. “While four courses are being served, the customer does this three times, so they can enjoy various kinds of cider to match the food.” It gets pretty busy going back and forth from the dining room to the barrels while thinking about pairing cider and food, but as Susan says, the light cider doesn’t interfere with the food, but has you wanting more. コースのメインは、この８オンスもあるリブアイ・ステーキ！ 追加の生サイダーなら、ぜひボトルでどうぞ。The main dish in the course is this hefty 8 oz. ribeye steak. 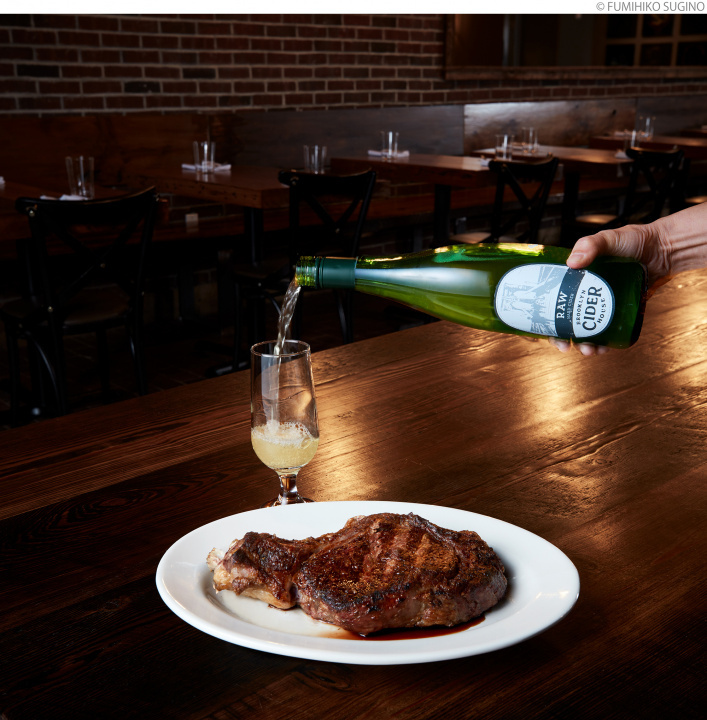 If you want more cider, try ordering by the bottle. 天井高に合わせて特注したステンレス製のサイダー醸造タンク。果樹園から直送されたリンゴジュースがここでサイダーになっていきます。Stainless-steel cider fermentation tanks were specially ordered to suit the height of the room. Apple juice sent directly from the orchards is made into cider here. Immediately after returning from Basque, the “lovestruck” Peter acquired an orchard because “in the United States, where cider is just sweet, there were no apples suited to making the traditional Basque cider,” and starting growing his own apples. 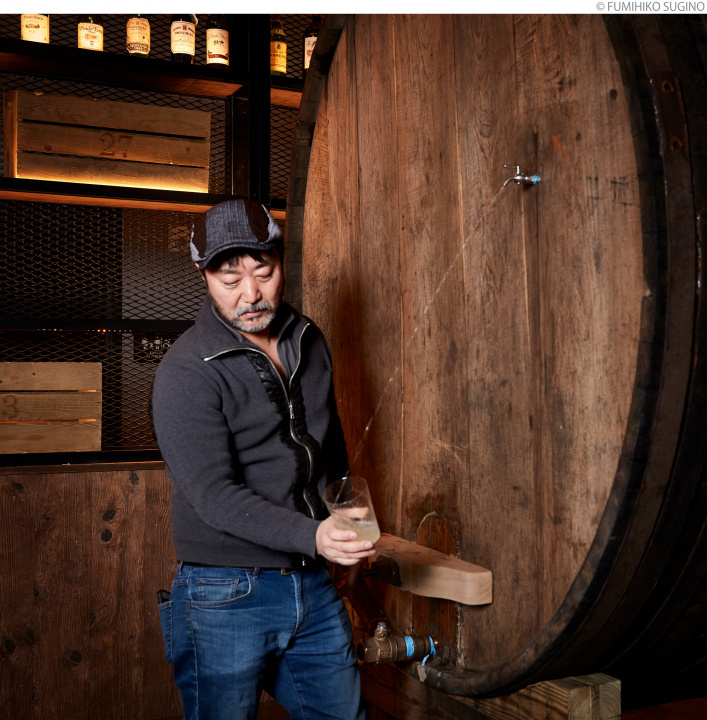 At the same time, he found and renovated an establishment with a brewery. Following this, after harvesting the apples, he began making cider. バスクの伝統的なサイダーの味や文化を伝えているブルックリン・サイダー・ハウス。たったひとつ違うのは、ブッシュウィックらしく、アーティストが店内や外壁にたくさんの絵を描いていることです。Brooklyn Cider House conveys the taste and culture of traditional Basque cider. The only difference is the many paintings by artists that adorn the walls inside and outside the restaurant—the Bushwick touch. Growing apples, making cider, and opening a restaurant in just four years is nothing less than a feat accomplished in the “frenzy of love.” But when you fall in love, you want people to understand that love. Susan, who was the first to understand what moved her brother, says that she now only drinks cider. I recommend that you share in this Basque culture while in Bushwick, with your partner or with anyone for that matter. It’s not often that you can have a “life-changing experience.” Look forward to an enjoyable and memorable night full of conversation. Looking for something old? You’ll find it in Bushwick! I’m not exactly sure when, but at some point in time, I began to frequently see people carrying the popular L Train Vintage and Beacon’s Closet shopping bags around Morgan Avenue station where many vintage clothing stores are located. A friend who was visiting the other day from Brooklyn’s Prospect Park said, “Until recently the place to go for ‘vintage’ was East Village, but now it’s here. 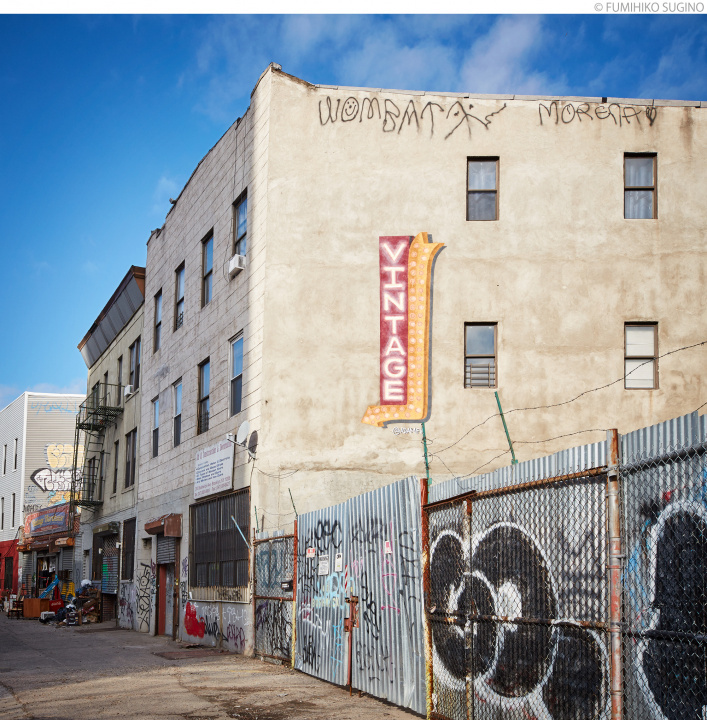 I can’t help but look into all the shops here, from large to small.” Just as he said, people going out of their way to come to Bushwick to look for “old things,” and not just vintage clothes, have clearly been increasing of late. 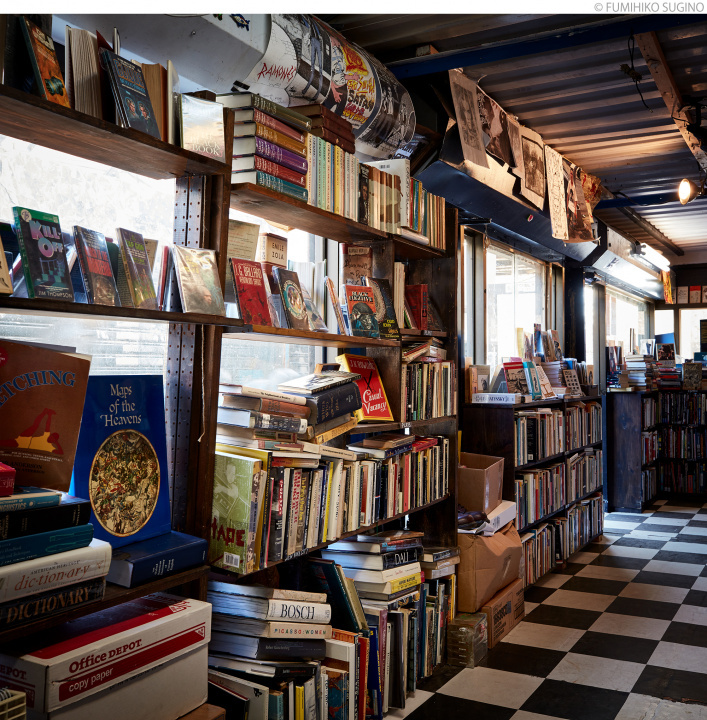 住宅街の一角にある古本屋「Molasses Books」(770 Hart Street, Brooklyn, NY 11237)。カフェ・バーもあるので、夜遅くまで、ワインを片手に読書ができます。　Used bookstore Molasses Books is located in a corner of a residential neighborhood (770 Hart Street, Brooklyn, NY 11237). It also has a café and bar where you can enjoy reading a book late into the night with a glass of wine in one hand. 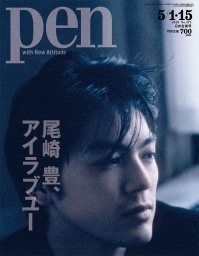 「Better Read than Dead」のオーナー、デビッド・モースさん（左）とマット・ダンジェロさん。輸送用コンテナが立ち並ぶ「The Alley Flea Market」の狭い路地にて。　David Morse (left) and Matt D’Angelo, the owners of “Better Read than Dead,” in The Alley Flea Market, a narrow street lined with shipping containers. 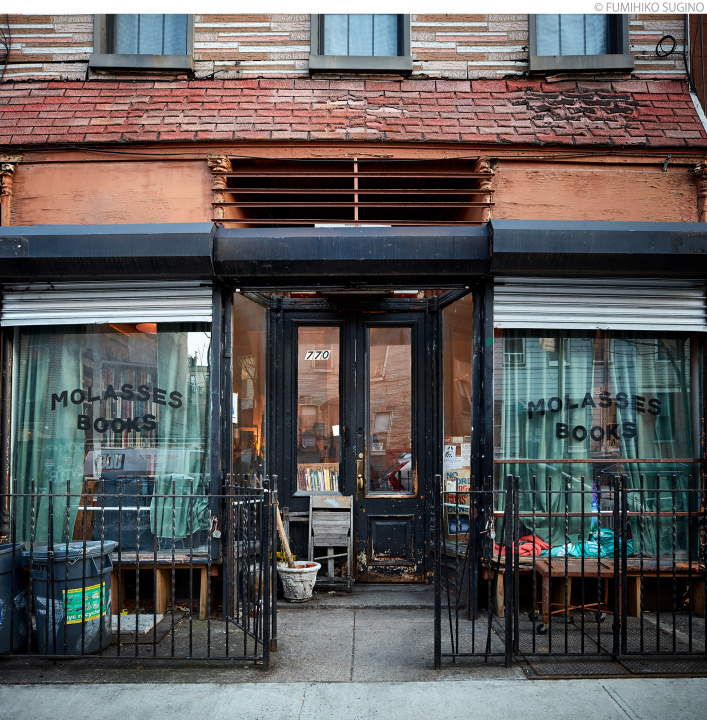 Around the time Molasses Books opened, there were two men selling used books on the streets of Bushwick. “For me, books are a part of life. 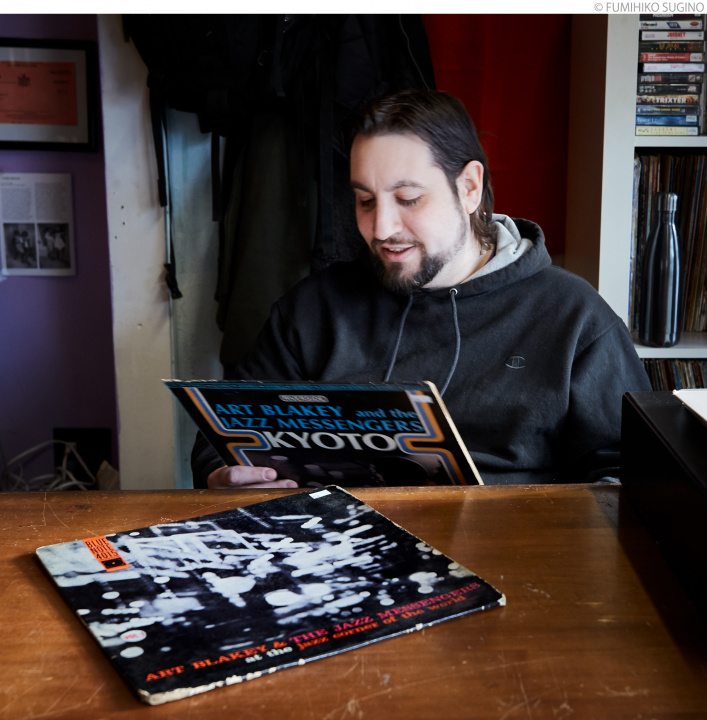 Since I was a child it was natural for me to go to a bookstore and buy something I liked,” says David Morse, co-owner of used bookstore Better Read than Dead, which is known as a bookstore with an impressive inventory of rare literature and poetry. “Selling books on the street is affected by the weather. 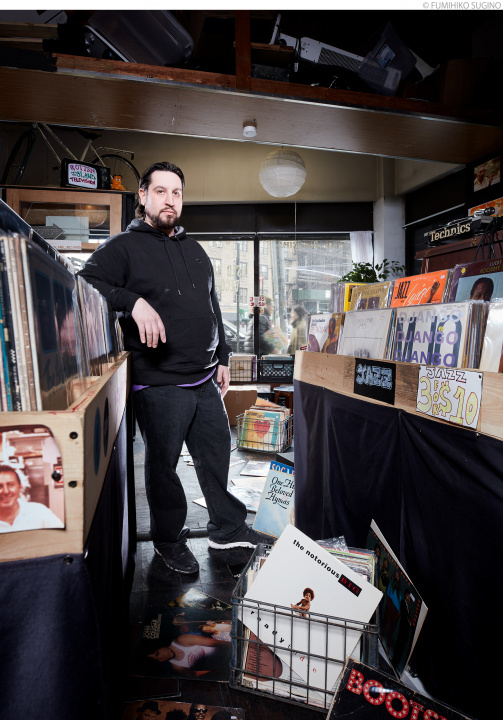 That’s why I jumped at the opportunity.” The opportunity he jumped at was to open, in the spring of 2014, a “store with a roof” so he could sell books every day, and the location was a market place called The Alley, a narrow street lined with repurposed shipping containers. Currently the tenants here other than Better Read than Dead include a tattoo shop, a store selling unique items and accessories, and a local radio station. 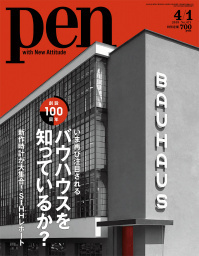 Better Read than Deadの店内。15000冊以上の古本で埋めつくされています。Better Read than Dead is packed with over 15,000 used books. 「Rotten Island Records」のオーナー、ザック・フェインバーグさん。「Rotten Island」は大好きな絵本の題名です。Zack Feinberg, owner of Rotten Island Records. Rotten Island is the name of his favorite picture storybook. 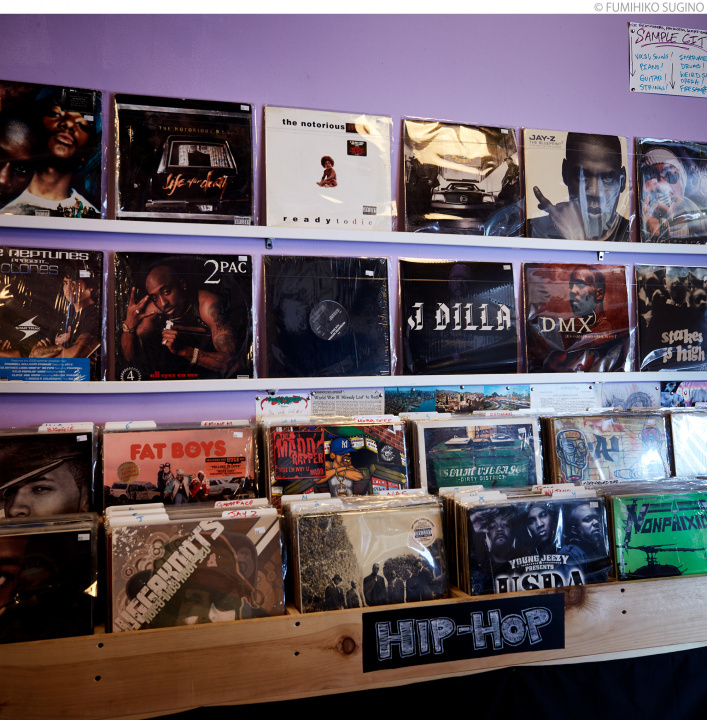 Rotten Island Recordsご自慢の「ヒップ・ホップ・コーナー」。探しものが見つかるかも！Rotten Island Records is proud of its hip-hop corner. You might be able to find what you’re looking for here! アート・ブレイキー＆ジャズ・メッセンジャーズの「隠れ名盤の代表作」と言われる「At the Jazz Corner of the World」を発見！Discovered “At the Jazz Corner of the World,” said to be the best of Art Blakey and the Jazz Messengers! There are still many more unique stores here that people like David, Matt and Zack started out of pure passion. And more new stores are also opening one after another in Bushwick. 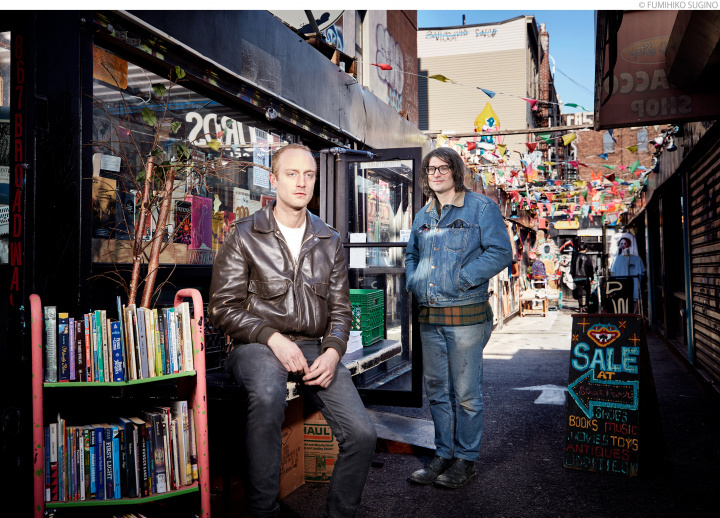 What’s so fascinating is that the “old things” they love so much is now something fresh for the younger generations.It’s clear that enthusiasm is growing over Bushwick’s vintage shops. If you can find the time to come here, be sure to check out the following recommendations. 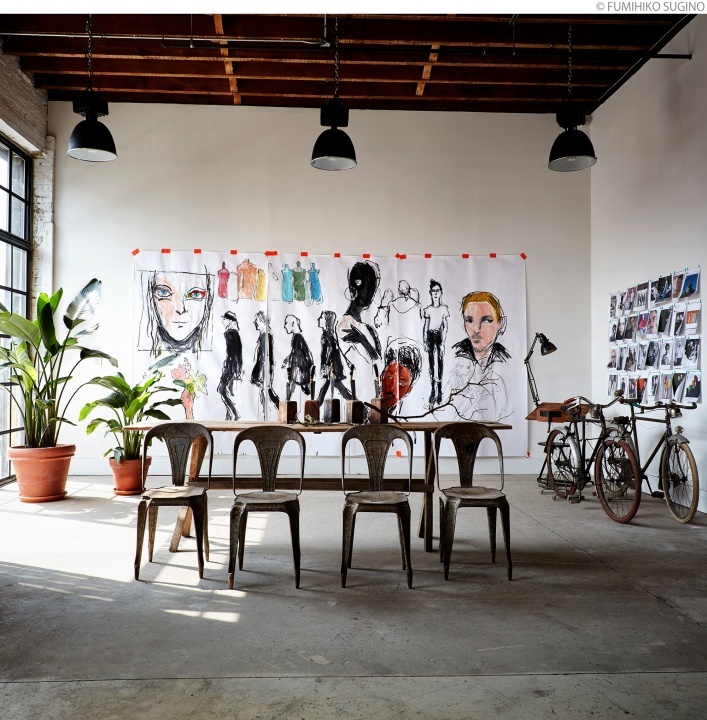 They are just some of the many captivating stores you’ll find in Bushwick. WORSHIP NYC（住所：117 Wilson Avenue, Brooklyn, NY 11237）　カジュアルからハイエンドなブランドまで、きれいな一着が見つかるおすすめの古着屋さん。メンズも充実しています。　WORSHIP NYC（117 Wilson Avenue, Brooklyn, NY 11237）A recommended vintage clothing store where you can find something nice from casual to high-end brands. It also carries a lot of men’s clothes. 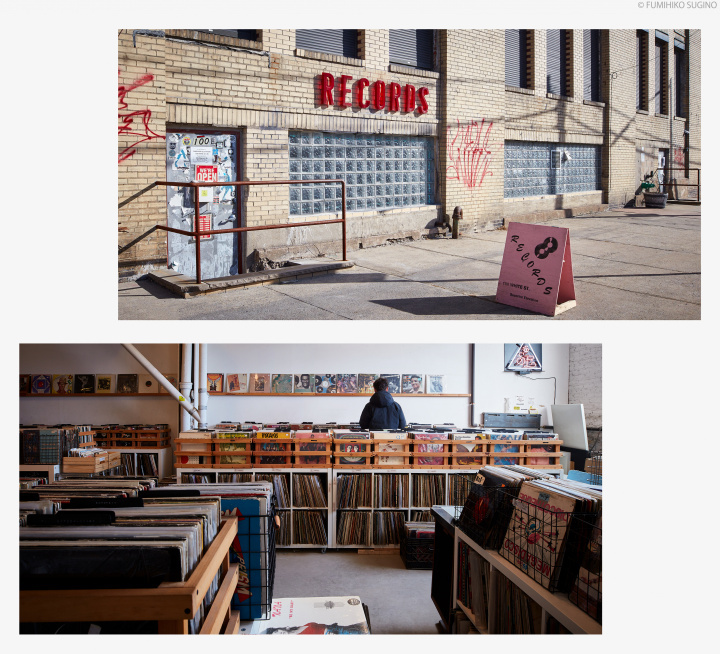 Superior Elevation Records（住所：100 White Street, Brooklyn, NY 11206）　オーナーのエレン（Ellen）さんが日系ブラジル人だけあってか、ラテン、レゲエ、ウエスト・インディアンなどのアルバムやカセットテープが多数！インターナショナルな一枚を探すならぜひここへ。Superior Elevation Records (100 White Street, Brooklyn, NY 11206). Perhaps it’s because the owner, Ellen, is a Japanese-Brazilian, but there’s a huge collection of albums and cassette tapes featuring music from Latin to Reggae and the West Indies. Come here if you’re looking for something international. 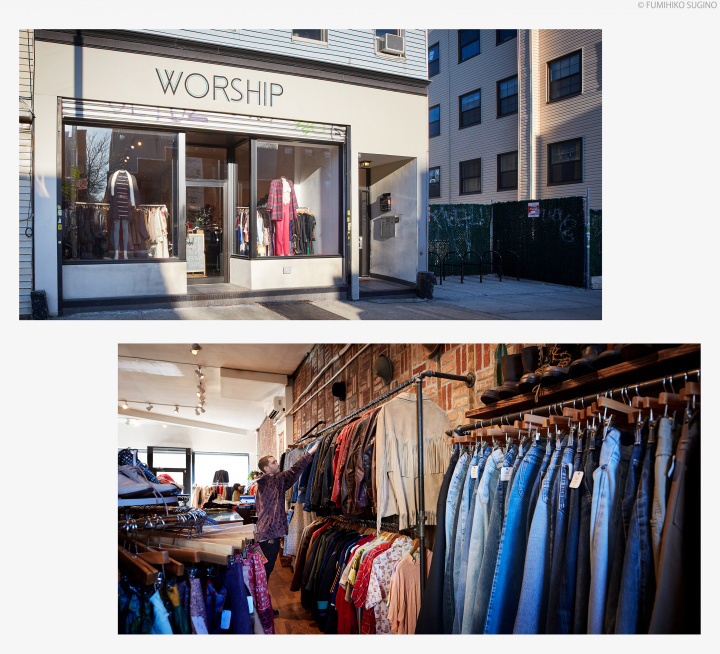 Reuse America Vintage Warehouse（住所：387 Bushwick Avenue, Brooklyn, NY 11206）　広い店内はまるで「ひっくり返したおもちゃ箱」。ヴィンテージ小物、アンティーク家具、ガラクタなど何でも見つかるお店です。Reuse America Vintage Warehouse (387 Bushwick Avenue, Brooklyn, NY 11206). The expansive store space is like an “overturned toy chest.” Here you can find anything from vintage items and antique furniture to odds and ends. 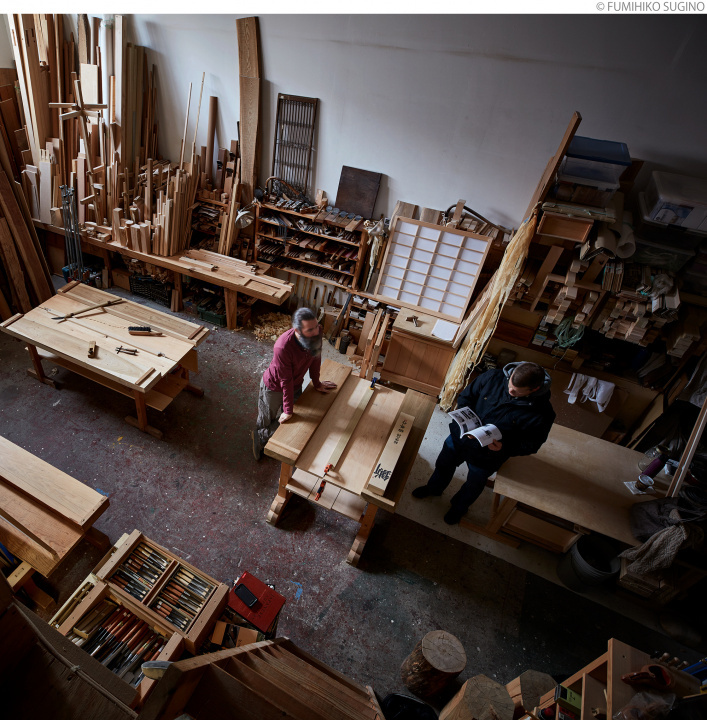 Learn traditional Japanese carpentry skills in Bushwick. 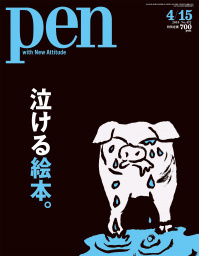 ブッシュウィックで日本の伝統的な大工の技を伝えている「MOKUCHI（モクチ）」のヤン・ジゲアさん。この日は「障子づくり」のクラスが開かれていて、5人の生徒が集まっていました。　Yann Giguère of Mokuchi, a woodworking studio in Bushwick that imparts traditional Japanese carpentry techniques to others. On this day, there was a shoji making class attended by five people. Something that strikes me every time I meet someone like Yann Giguère is that I’m a Japanese but I still don’t know enough about my country. For instance, the words “tsugite,” “shiguchi,” and “yari ganna.” I am ashamed to say that until I met him I didn’t really know what these words represented. 「機械より、手工具を使うほうが楽しい」と語るヤンさん。伝統工法「木組み」の凸凹も、こうして手でていねいに加工されます。　“It’s more fun using hand tools than machinery,” says Yann. 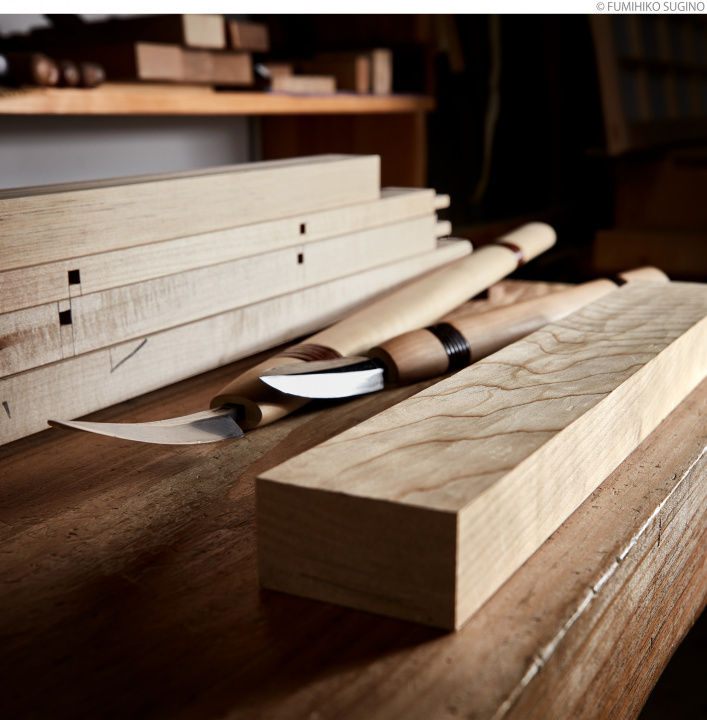 The mortise and tenon of the traditional method of “kigumi” or wood joinery, are made painstakingly like this by hand. 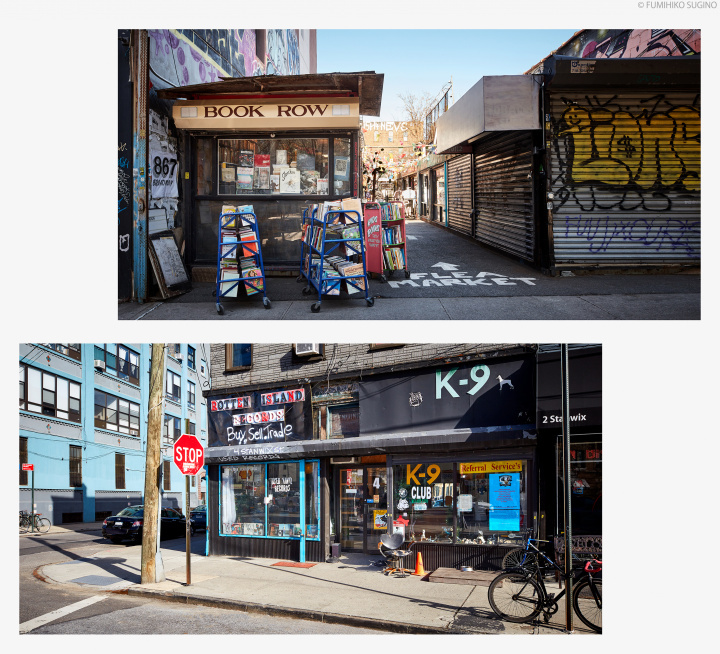 Yann’s studio, Mokuchi, is located close to Morgan Avenue station on the L train. The classes he started in Bushwick are not just regular woodworking classes—they teach teach traditional Japanese carpentry techniques! For example, kigumi, often used in building temples, shrines, and, in the past, homes, is a traditional technique that does not use nails or adhesives to join beams but uses carefully handcrafted interlocking wooden joints to secure structural strength. Splicing wood together is called “tsugite,” and joining two or more pieces of wood at angles is called “shiguchi.” Here at Mokuchi, Yann teaches woodworking techniques including “kanawatsugi,” which is one of the strongest ways for joining using traditional techniques, and a type of “shiguchi” called “shachitsugi,” which very few carpenters do now. 2日間の障子づくりクラスで完成させるのは、2×2フィートの小さな障子（右）。参加するには、あらかじめ鉋と継手のクラスを受講する必要があります。　A small shoji screen (right) that is 2×2 feet is completed in a two-day shoji making class. To participate in this class, you need to have taken the “kanna” and “tsugite” classes. This shoji making class is one of the most popular classes at Mokuchi, and on the day I visited the studio, there were five people attending it, including a person who likes to DIY, a carpenter who works at commercial sites such as fashion shows, and a craftsman who makes small items of furniture at home. Their reasons for participating in the class were various, from wanting to learn about Japanese tradition and broaden their knowledge, to wanting to use Japanese tools. 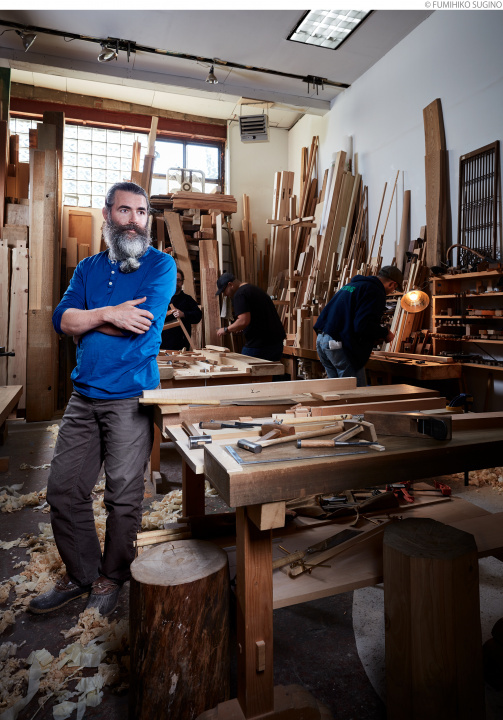 Yann is also a craftsman who engages in works such as making tailor ordered bathtubs made of hinoki cypress in his studio, as well as the interior woodwork of Japanese restaurants in Manhattan. But why is Yann, a French Canadian originally from Quebec, so devoted to conveying to others the depth of this Japanese tradition. 幻の道具とも言われる「槍鉋」の使い方を、独学で習得したヤンさん。削りカスも、普通の鉋のものとはまったく違います。　Yann was self-taught in the use of the legendary carpentry tool, “yari ganna.” The fine shavings are completely different from that of a usual hand plane. After graduating from high school, Yann went to Iowa to learn English for a year. But as he was able to complete his language studies in half a year, with the time remaining, he took a furniture-making class that was held at the school. 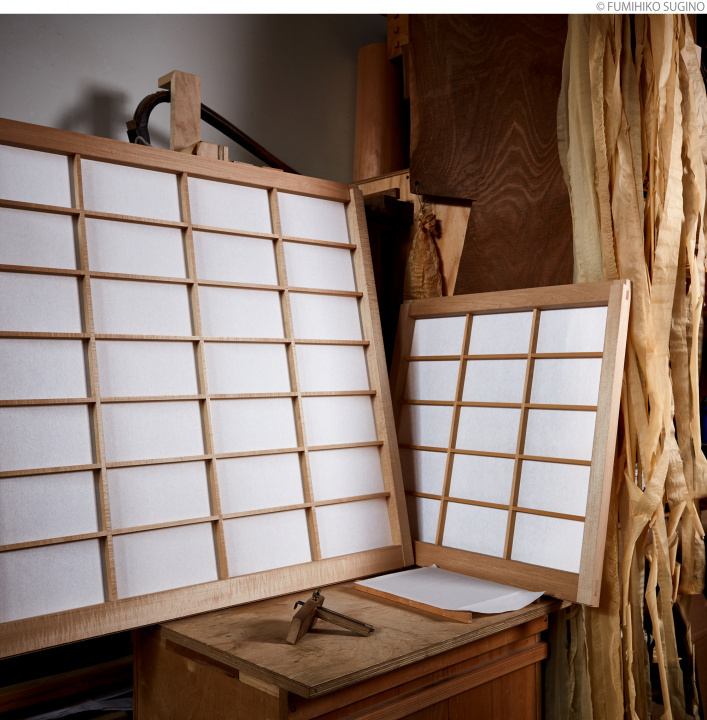 Dale, the leading expert in this industry, learned how to construct Japanese teahouses in the United States and also studied as a journeyman in Japan. 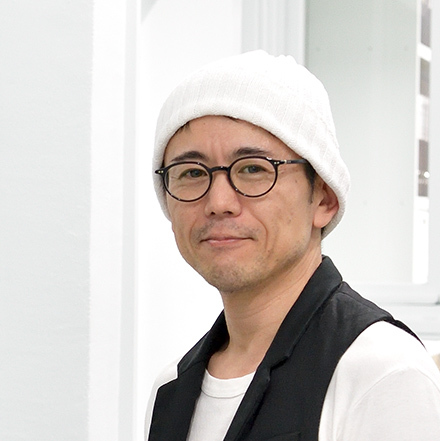 He founded Takumi Company in 1987 and has been engaged in traditional Japanese woodworking ever since. 削った木材の表面に、繊細でなめらかな凸凹をつくる槍鉋。まさかここブッシュウィックで見られるとは思ってもいなかったので、その味わい深い表情には驚くばかりです。　The yari ganna plane makes smooth and sophisticated dimples on the surface of shaved wood. I had never thought that I would see something like this in Bushwick, and so I was astonished by its depth of expression. But why is he so attracted to Japanese woodworking? “It’s probably because it looks simple, but such extremely complex work goes on behind it. It’s like the movie, “Tampopo.” This film released in 1985 is a masterpiece directed by Juzo Itami, which tells the story of a woman proprietor of a ramen noodle shop who struggles to perfect the art of making delicious ramen. 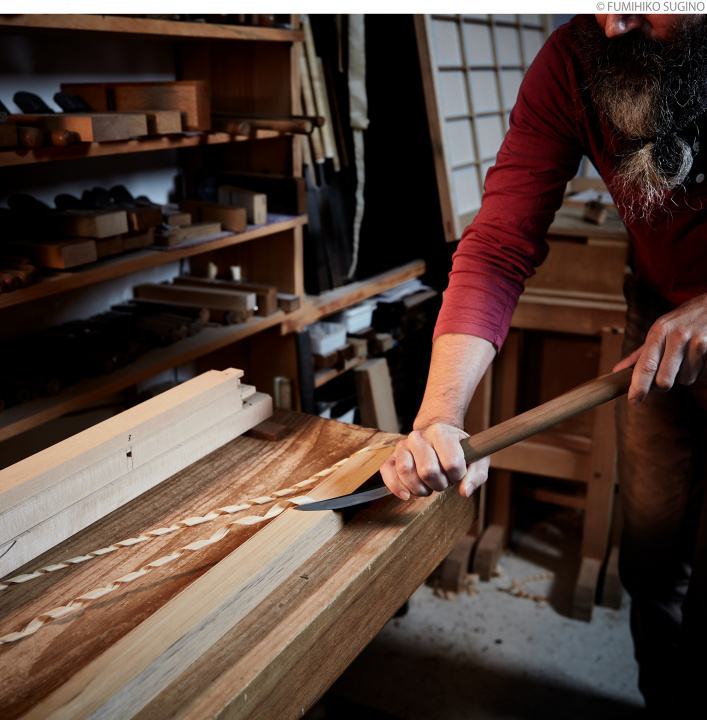 While saying so, he skillfully shaved wood using the yari ganna, a tool that is rarely used by regular carpenters. The yari ganna is a legendary spear-shaped plane that disappeared with the growing popularly of the “dai kanna” plane, which came over to Japan from China around the mid 15th century. With its distinctive spear-shaped blade, how the yari ganna is used, and the finish it achieves is completely different from the dai kanna plane. またひとり、ヤンさんのもとを訪ねてきた生徒（右）がいました。カナダで大工をしているそうです。こうして日本の伝統技術が伝わっていきます。　Another student (right) has come to see Yann. He’s a carpenter from Canada. This is how the traditional techniques of Japan are passed on to others. 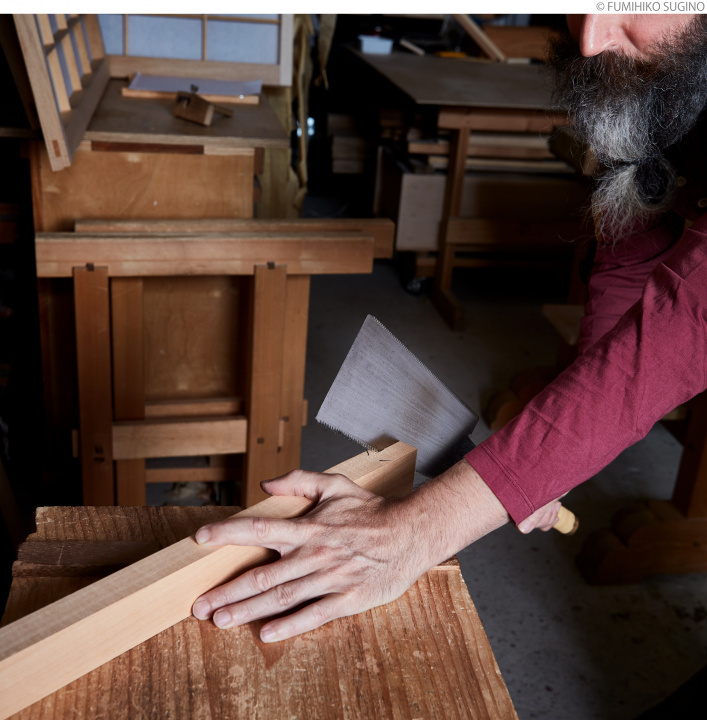 If there is anyone in Bushwick who feels apologetic like me or who is looking for an opportunity to firmly study a part of Japanese tradition, why not participate in “Japanese Woodworking Introduction,” a beginner’s class where you can listen to Yann speak for a full two hours. This is just the place where you can come to further appreciate Japanese wisdom, efforts, and skills, which you were never aware of in Japan. As a Japanese, I thank people like Yann Giguère from the bottom of my heart. When in Bushwick, be sure to stop by these two stores to casually enjoy Eastern European cuisine. 街でよく見かけるデリカテッセンですが、ここ「セネカ・ガーデン」はポーランド人の店です。　One of the many delis you see around town, but Seneca Garden is Polish. "If you're going to a diner, go to one run by a Greek." That’s what a New Yorker told me shortly after I arrived in the city. This hint to finding good places to eat proved to be quite helpful. Hamburgers and pancakes are fixtures at American diners, so diners are all pretty much the same—or so I thought at the time. When I lived in downtown Manhattan, every morning I would go to a Korean grocery in my neighborhood and take out a bagel with lots of cream cheese. As you know, a bagel, a typical New York breakfast item, is a type of bread said to have been brought over to the United States by Jewish people from eastern Europe. Then, you may be wondering, what was I doing buying this every morning at a store run by a Korean? But as you also know, New York is a city of immigrants. Back in those days when there were still very few cafes where you could have breakfast, a clean and well-stocked Korean grocery in the neighborhood was a requisite. セネカ・ガーデンの総菜コーナーはランチにお薦め！ 日本人も大好きなロールキャベツ、肉や白身魚のフライ、ハンガリー伝統のビーフシチュー「グヤーシュ」などが並びます。　Seneca Garden's deli corner is highly recommended for lunch. The delicacies offered include cabbage rolls, a Japanese favorite, deep fried fish and meat, and goulash, the traditional Hungarian beef stew. Time passed, and I made a Polish friend. He took me to Greenpoint in Brooklyn, which was, at that time, home to the largest Polish community in New York. There I found that Polish food is a perfect match to Japanese taste buds. So much so that doughnuts filled with a not-too-sweet jam; smoked sausage, kielbasa, that is delicious even by itself; and a white borscht soup with just the right amount of tang, have become standard fare in my household. 右からセネカ・ガーデンのオーナー、グレゴリー・ヴァリグラさん、シェフのアリシア・シュフェンスコフカさん、開店当初からの従業員アグネスカ・シュコフスカさん、グレゴリーさんの娘ニコル・ヴァリグラさん。手前のトレーに載っているのが、出来立てのポーランド風餃子「ピエロギ」です。　From right: Gregory Waligora, proprietor of Seneca Garden; Alicya Swieczkowska, chef; Agnieszka Siolkowska, a member of the staff from when the store opened; and Nichole Waligora, Gregory's daughter. On the tray are freshly cooked Polish dumplings called pierogi. 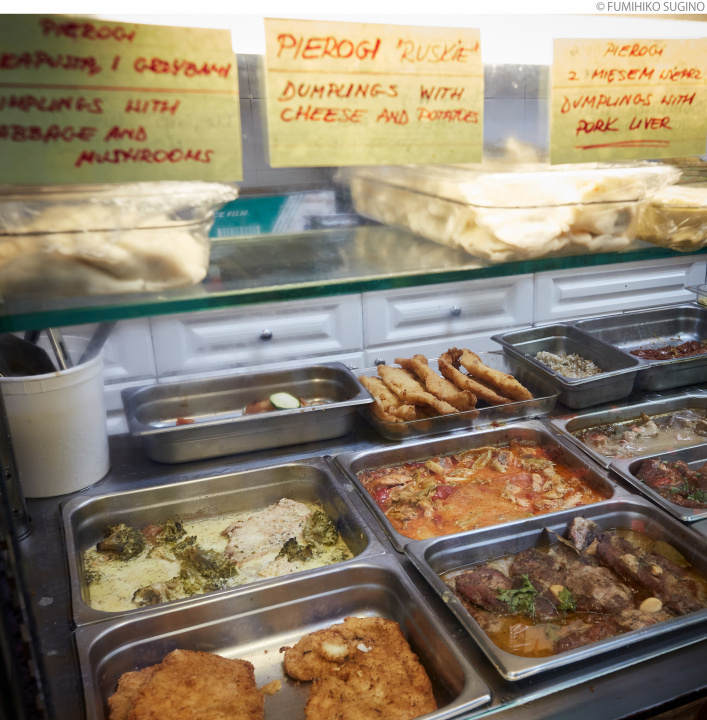 My current apartment in Bushwick is just a few blocks away from Ridgewood in the neighboring borough of Queens, and so I was able to find my way to the Polish delicatessens without any problem. 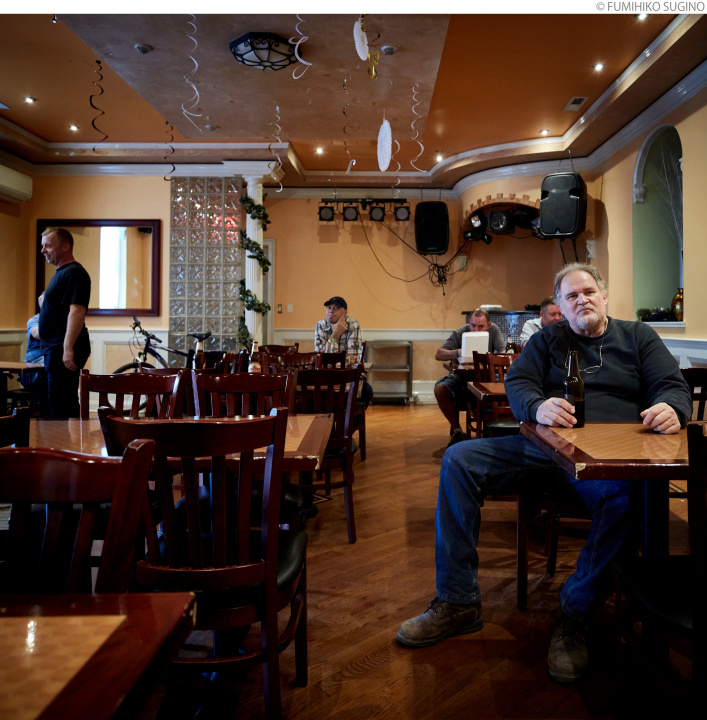 "When I came to America around 2002, Ridgewood was second to Greenpoint in its Polish community. 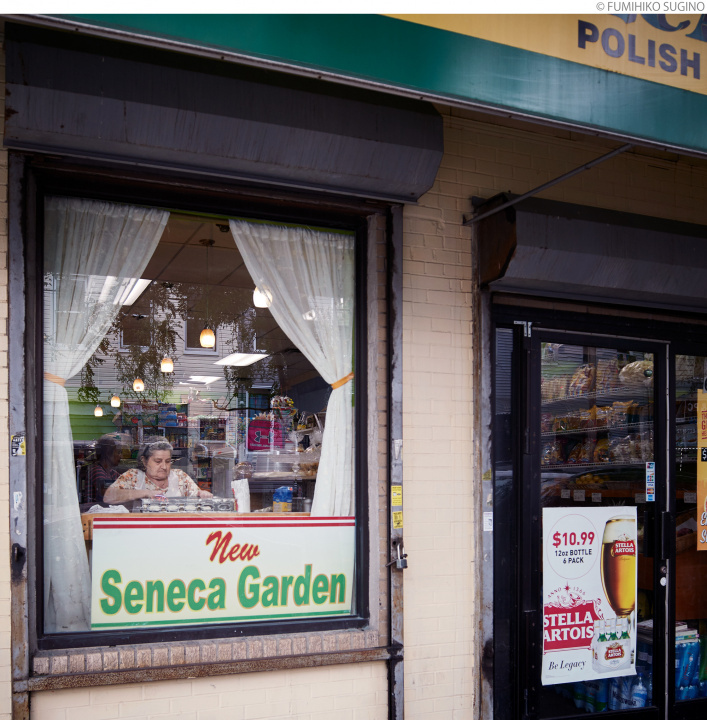 But more people started moving here due to soaring rents and other reasons, and several years ago it became home to the largest Polish community in New York," says Gregory Waligora, proprietor of Seneca Garden, which serves the best deli items by far. Thanks to this store, I can always purchase my favorite Polish ingredients in my neighborhood and casually enjoy freshly cooked Polish dumplings called pierogi. This is getting to be quite addictive since the pierogi at Seneca Garden are the best I've ever had. セネカ・ガーデンの広々としたイートインスペースで寛ぐお客さんたち。大型テレビがあるのでスポーツ観戦ができたり、誕生日などプライベートなパーティにも使えます。　Customers relaxing in the roomy dining space of Seneca Garden. People can watch sporting events on its large television, and hold private parties for birthdays and other occasions. Pierogi is Polish soul food that can be enjoyed deep fried or cooked with either hot or sweet fillings, such as meat, cheese, and berries. 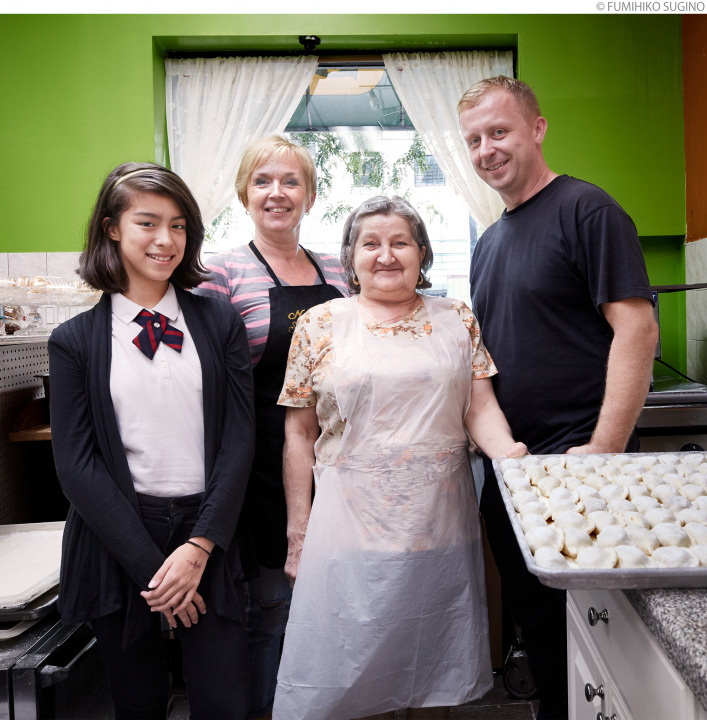 "Alicya has been a chef for years, and she still enjoys making pierogi; so of course it's great! We plan to offer gluten-free pierogi in the near future." Before starting this store, Gregory used to deliver bread. "One day a friend told me about this store, and I decided to become the new owner. That was four years ago. My wife does the accounting, and we also have a staff member who has been working here since the store opened. I think all of this was made possible through the cooperation of my family, relatives, and friends." As testament to this, I could here boisterous sounds coming from the dining space at the back of the store. "They're our friends. They all gathered here today for a soccer match." 「リッジウッド・ヨーロピアン・ポーク・ストア」の店主、ヨネル・ピシオエインさん。ニューヨーク・タイムズ紙に2度も掲載されたとのことで、その時と同じポーズをとってくれました。　Jonel Picioane, proprietor of the Ridgewood European Pork Store. He appeared in the New York Times twice. Here, he gives us the same pose he took then. Just two blocks away from Seneca Garden, there is another store that you would definitely want to stop by. "My father came here from Serbia in the 1960s. He was first employed by this store, which has been open from the 30s, and became its owner in 1975." 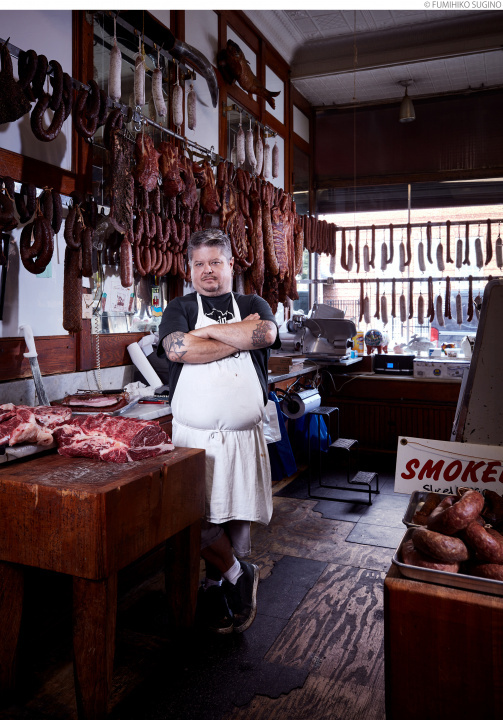 So says the second-generation owner of Ridgewood European Pork Store, Jonel Picioane. You'll start to feel excited the moment you open the door. That's because of the aroma of smoked meat that fills the air. And you'll find yourself unable to take your eyes away from the various European sausages that are strung up around the store. 1930年代の創業当時のままの店内。リッジウッド・ヨーロピアン・ポーク・ストアでは、セルビア、ハンガリー、ルーマニアなど東欧からの珍しい食品も扱っています。　The store remains just like it was when it opened in the 30s. 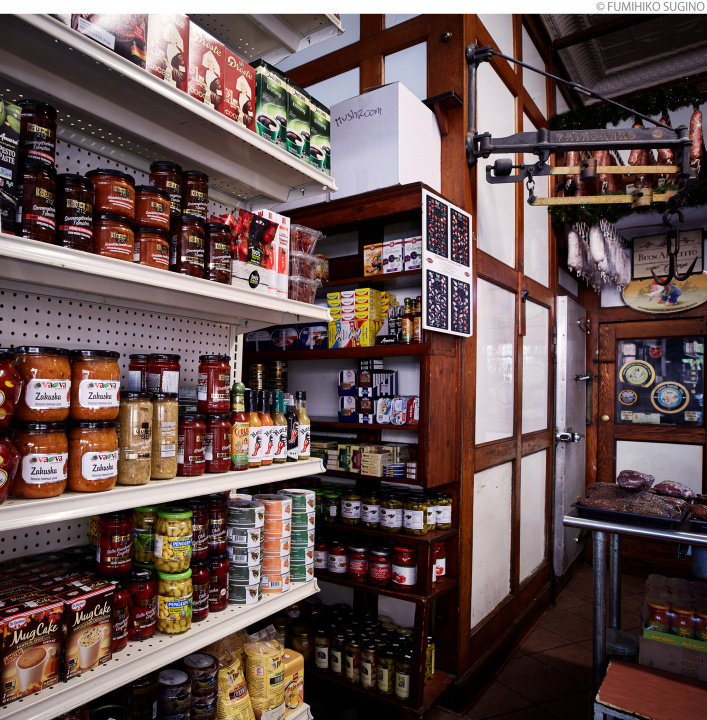 Ridgewood European Pork Store also handles unique food items imported from Serbia, Hungary, Romania, and other parts of eastern Europe. Jonel goes on to proudly state, "I've been here for all of 47 years since I was about 1 year old, and learned everything from my father. Just take a look at this store. Everything remains just like it was in the 30s, even the ceiling and walls!" He explains that tools and methods from that time are also used for smoking the meat, which is done in the store's basement. Of course, the store's best seller, bacon, is clearly different from the overly salted products you find in regular supermarkets. 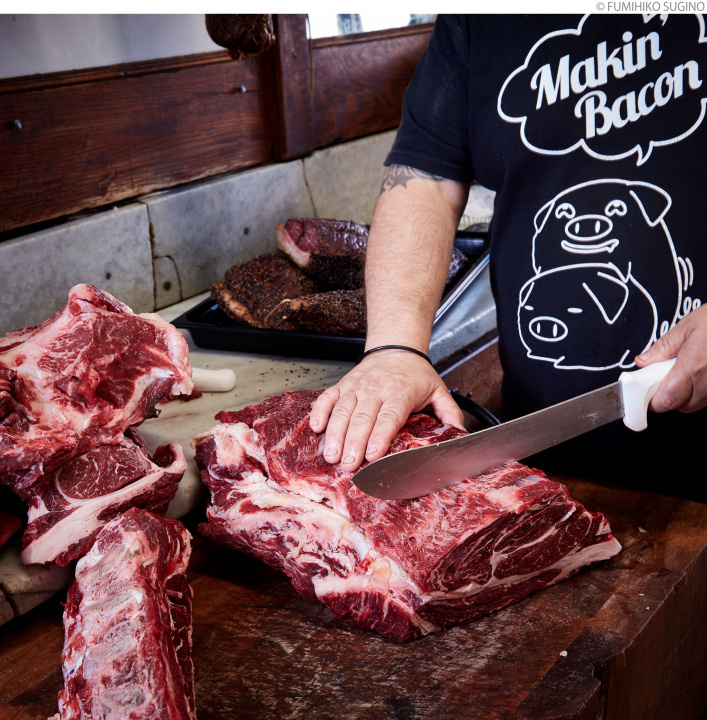 "For example, major food companies have no qualms about adding brine to sausages to make them look plumper, or selling 'smoked-like' products that haven't been properly dried and smoked. I would never do that. I also use only a minimum of salt. I stick to traditional methods to make our products." リッジウッド・ヨーロピアン・ポーク・ストアはもともと食肉店なので、客の要望に合わせて肉を切り分けてくれます。すき焼き、しゃぶしゃぶのカットもお任せあれ！　Ridgewood European Pork Store is originally a butcher shop and so will cut the meat as requested by the customers. You can even order cuts for sukiyaki and shabu shabu. But because "customers will tire of our products if we keep on making just the same things," he is also churning out new recipes. And he told me, "I have over 200 recipes in my head. Those I learned from my father, and about 40 recipes that I made myself. A memo? No such thing exists. But I guess I should write them down somewhere before I die." There was also nothing more gratifying than my purchase one day of bacon, two kinds of ham, and two sausages that added up to only 12 dollars. 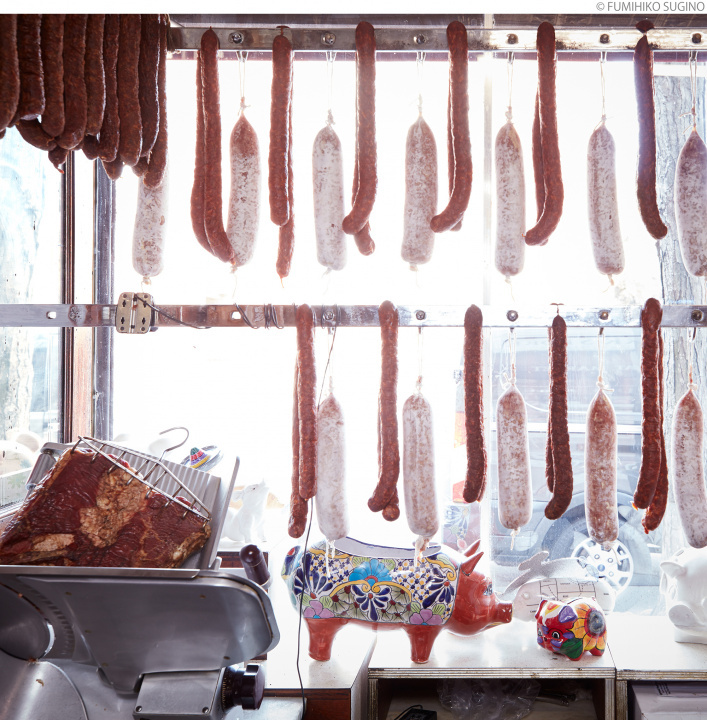 In pricey New York City, places where you can purchase traditional and elegant charcuterie at this price are rare indeed. 店内の壁や窓にかけられた自慢のソーセージ。細めの「ハンガリーソーセージ」はパプリカが効いています。白っぽいのは、ヨネルさんのオリジナルレシピで仕上げた「フレンチソーセージ」。その他イタリア、ドイツ、スペイン、ギリシャなどのソーセージ、ハムやベーコンを手づくりしています。　The store takes pride in its sausages, which are hung on the walls and windows of the store. The thin Hungary Sausage is flavored with paprika. The white French Sausage is a Jonel original. He also makes sausages, ham and bacon from Italy, Germany, Spain, Greece, and other countries. So that's why I'm still a foodie. And there's certainly no reason to keep you from becoming one in NYC. The presence of those who uphold a country's food tradition by serving tasty dishes at affordable prices makes me again acutely aware of the fact that many of these people are the immigrants, their families and friends who built this country. Especially today when we hear appalling talk of "exclusion," "division" and "deportation," I believe that the remark made somewhat emphatically by Jonel, "That is talk from the 'world of politics.' You don't see such absurd conflict around us, do you?" will live on far into the future. Sampling the eateries in NYC, the "capital of immigrant culture," in a tour that goes beyond Bushwick and Ridgewood will always serve as my textbook for learning about the world. 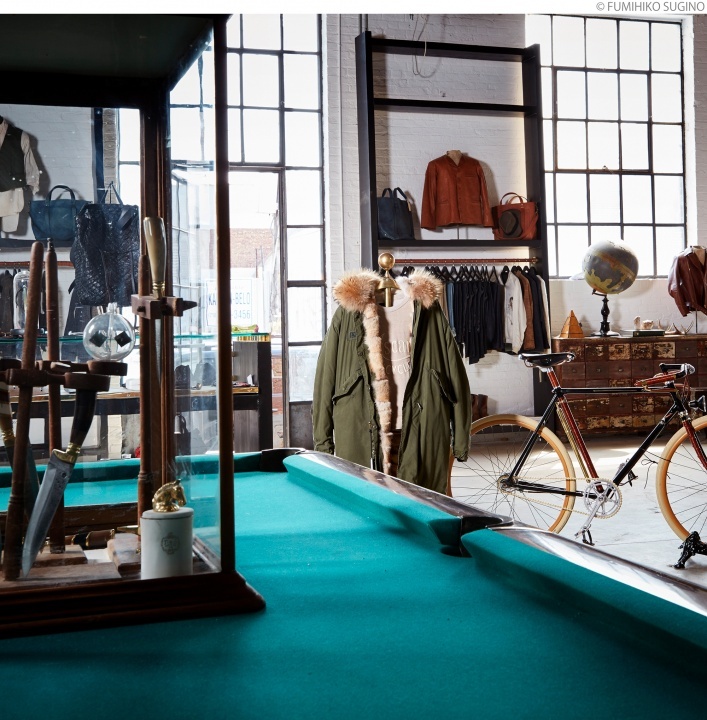 A comfortable space for men embodied by The Space NYC. 「The Space」の創業者、マックス・ポギーラさんが昔ながらの手法にこだわってつくるナイフと、同じく創業者のヘリオ・アスカリさんがデザインしたサングラスなどのアクセサリー。　Knives made by The Space cofounder Max Poglia using traditional methods, and sunglasses and other accessories designed by cofounder Helio Ascari. I found "that place" by pure chance. 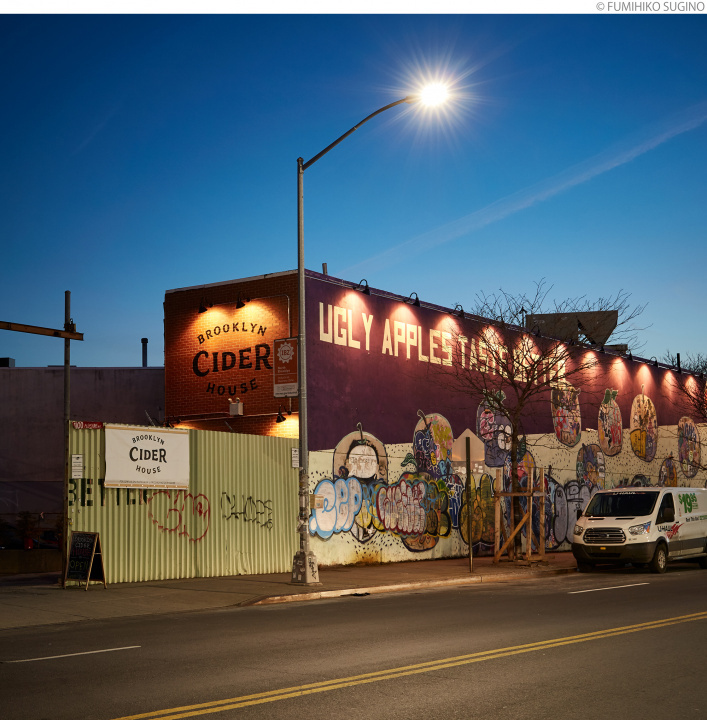 Bushwick is now changing rapidly, but it was originally an industrial area lined with factories and warehouses. The corner where you find "that place" is also a neighborhood dominated by car repair shops and parking spaces for large crane trucks-a bleak area, but so very Bushwick. Hearing that a popular local restaurant had relocated to this obscure part of town, I dropped by. And that was when "that place" suddenly appeared before me. 取材当日、もうひとりの創業者でミラノを拠点に活躍するファッションデザイナー、アレッサンドロ・スクアルツィさんには会えなかったのですが、トルソーに着せられ、ショップ中央に置かれた贅沢な仕立てのミリタリージャケット（2245ドル）が彼の存在の大きさを教えてくれました。　On the day of the interview, I was not able to meet another cofounder of The Space, Milan-based fashion designer Alessandro Squarzi, but a luxurious military jacket ($2,245) displayed in the center of the shop proclaimed his presence. A space repurposed from a warehouse, nothing new. But then I looked in the window and was amazed by what I saw. Clothes, bags, shoes and other men's items that would look good on adults were casually and comfortably arranged, but were immediately recognizable as items that were made with great care. "We three met each other several years ago at Pitti Uomo*. Much of my friendship with Helio originates from both of us being native to Brazil. Moreover, all of us share the concept of an Italian heritage, and have deep respect for it." 遊び心たっぷりの「The Space」には古いビリヤード台が置いてあって、冗談を言いながら一戦交えるマックスさん（右）とヘリオさん。おふたりの仲のよさが伝わってきます。　An old pool table demonstrates the playful spirit of The Space. Max (right) and Helio joke around as they play. It's obvious that they're good friends. So says Max Poglia, a designer who produces items such as handmade knives and leather bags from his own lifestyle brand, Poglia. By "we three," he means himself, leading Italian fashion designer Alessandro Squarzi, and Helio Ascari, the head of a high-end handmade bicycle brand, Ascari Bicycles. These are the three who created that place, called The Space. 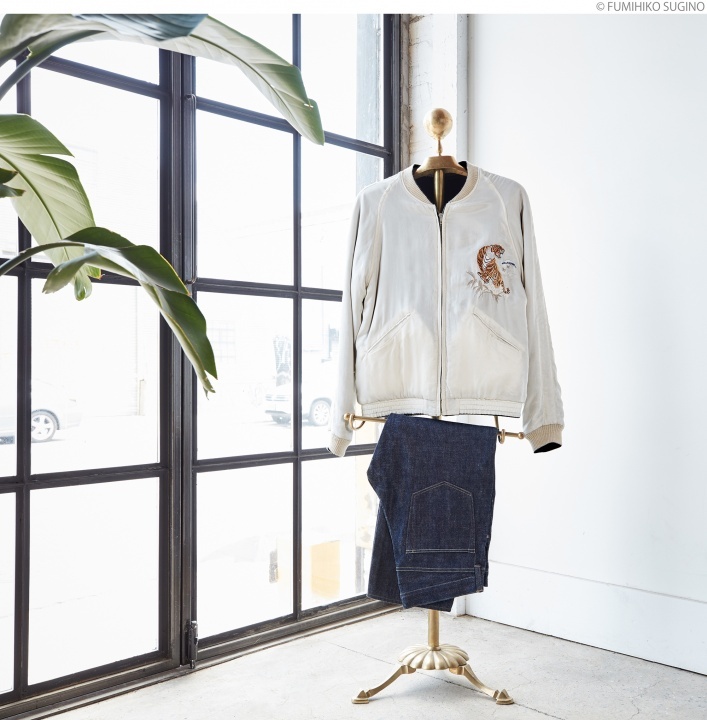 東京からのコラボレーター、「OLD JOE BRAND」のベルベットのリバーシブルジャケット（1150ドル）とデニムパンツ（290ドル）。「OLD JOEは僕らの大切な友人。ぜひ遊びに行ってね」とマックスさん。　A velvet reversible jacket ($1,150) and denim pants ($290) by Old Joe, a collaborative brand from Tokyo. "Old Joe is a valuable friend of ours. Please go visit them," says Max. "We already have our own individual brands, and we have each observed the rapid changes in fashion and handmade items in the retail industry from different angles. So we want to use our diverse networks to take our inspirations and visions further. We wanted to have a place where we could invite our clients and friends to physically share our brands. But at that time we didn't have a clear outline of what we wanted, so we called that place, The Space. After a while, that name started to feel perfect." 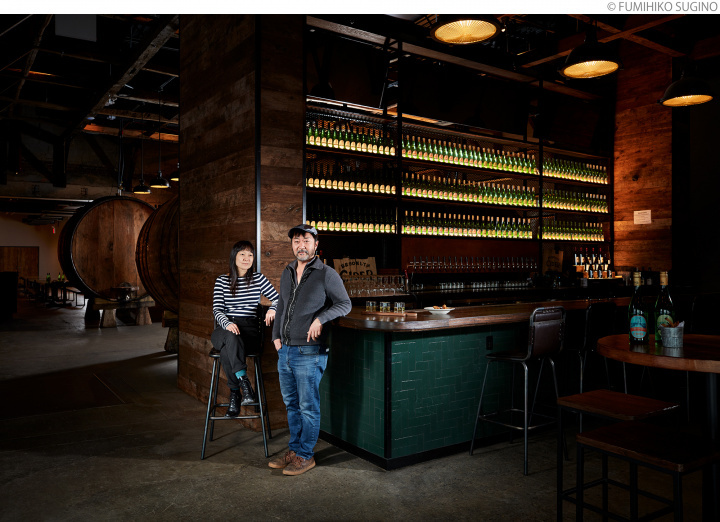 The Space brought to that bleak area not only the showcases of the three cofounders, but also the projects of collaborators linked by the key terms, "vintage," "timeless," and "craftsmanship. 「こんな場所があったらいいのに！」と思う人も多いのでは？　「The Space」の一番奥に併設された工房でマックスさん、ヘリオさんの製品はつくられています。　There are probably many who wish for a place like this. In the far back of The Space is a workshop where Max and Helio craft their products. The Space even has a workshop attached to it. "Why do I make knives? My grandfather used to run a hardware store in Brazil, and gave the customers knives as presents. I grew up watching that," says Max, who grew up in southern Brazil as an Italian immigrant. 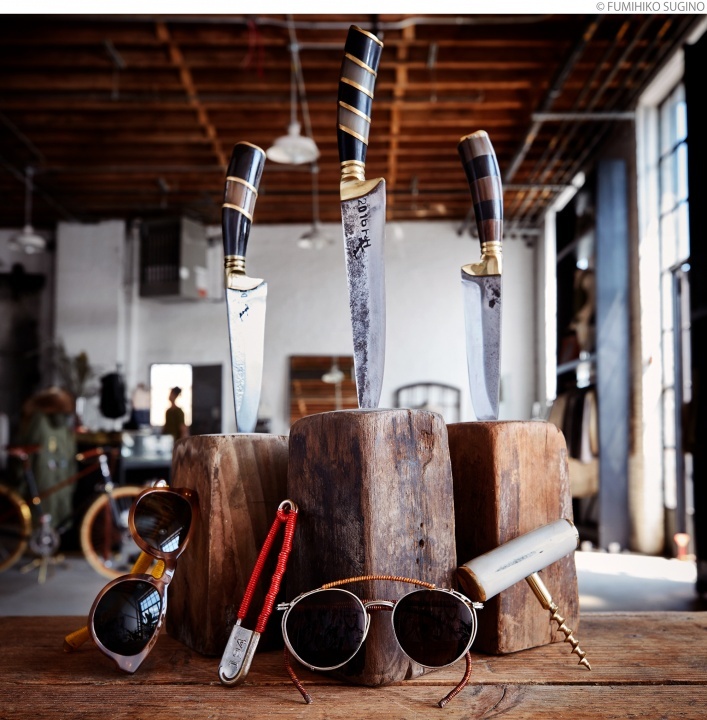 His perspective is always based on "traditional craftsmanship" and "traditional materials," and in this workshop, he designs superb knives decorated with such materials as wood, leather, and animal horns. 1950年代、アスカリ家は自動車をつくっていたそうです。その子孫、ヘリオさんがハンドメイドしたこの自転車（20000ドル）には、なんとルビーがあしらわれています。　The Ascari family made bicycles in the 1950s. This bicycle ($20,000) made by Helio, an Ascari descendent, is even decorated with rubies. Helio of Ascari Bicycles was working here on that day. He very happily told me, "A family member, my family, Alberto Ascari, was a F1 driver in the 1950s. He even won at the Mille Migilia*. That's why I'm also participating in the race. And, how do you say it, I came to strongly wish to have more various people learn about my family roots, Italian history and its great cultural legacy." Just like Max, Helio was an Italian immigrant to Brazil. Since he was a child he loved to fix old things. He also had a diverse career: a steel furniture store employee, carpenter, wood furniture craftsman, and fashion model. 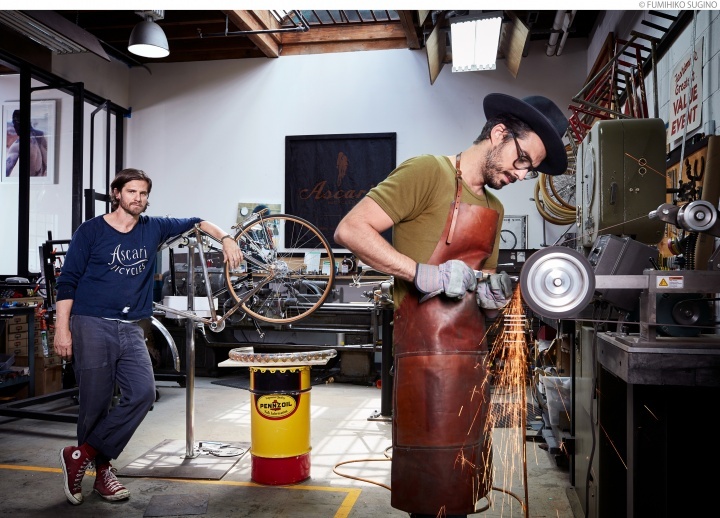 After he became devoted to making bicycles, he held his first workshop in Portland, and following that, in 2011, founded Ascari Bicycles. 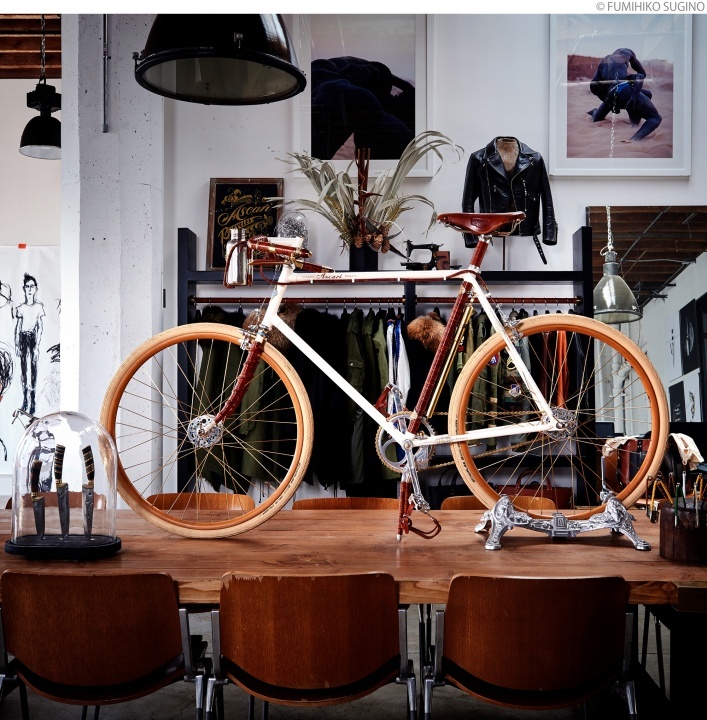 Helio has since then been making one-of-a-kind bicycles, all handmade. ポップアップギャラリーとしても使えるスペース。古い家具は友人のディーラーがセレクトしたもので、購入も可能です。　A space that can be used as a pop-up gallery. The old furniture was selected by a friend who is a dealer, and can be purchased. To sum it up, that place had a mature atmosphere for men-one that does not exactly blend in with the vibe of Bushwick today. So that there is no misunderstanding, let me add that the fast and straight messages of the young artists who have been driving this area are always very stimulating. But there are times you want to stop for a while to slowly savor something. And, to be honest, it was hard to find a place like that here. But then came The Space. 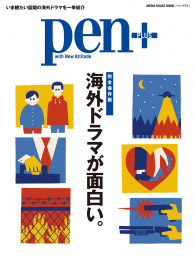 地元のバーバー「Persons Of Interest」ともコラボレーション。素敵なこの空間でヘアカット、いかがですか？　予約はネットでどうぞ！　Collaboration with a local barbershop, Persons of Interest. 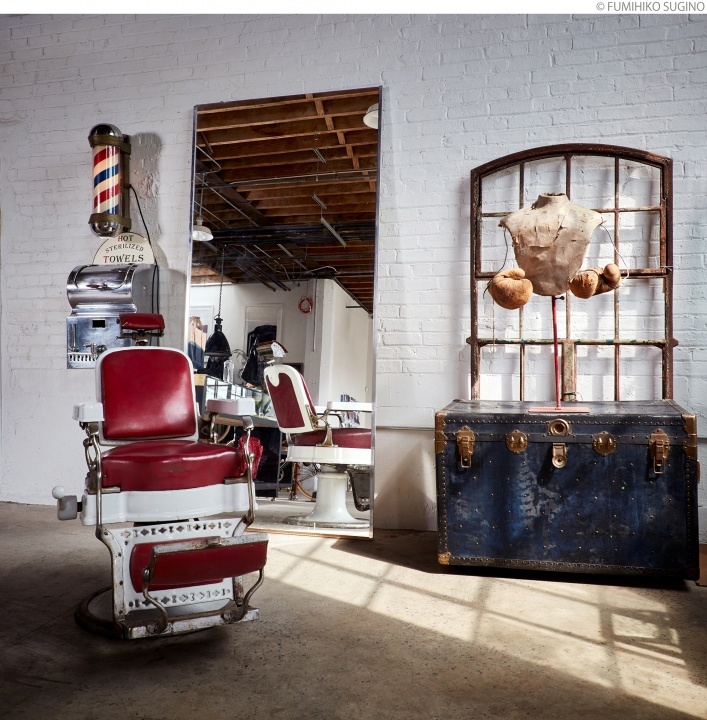 How about a haircut in this fabulous space? Book an appointment over the Internet. Enjoying conversation with the cheerful Max and Helio. Never tiring of looking at the beautiful objects there. It made me feel glad that I am adult enough to appreciate authenticity. I give it my blessings and will continue to sing its praises. Please come and confirm with your own eyes the true value of The Space. Bushwick is gradually growing up. 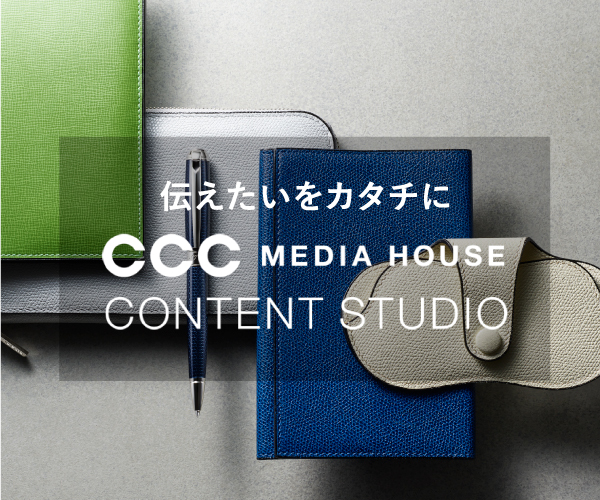 Copyright©CCC Media House Co., Ltd. 2019 All rights reserved. No reproduction or republication without written permission.